Function of UGT. The UDP-galactose transporter is a nucleotide sugar transporter that pumps UDP-galactose into the ER and Golgi apparatus. 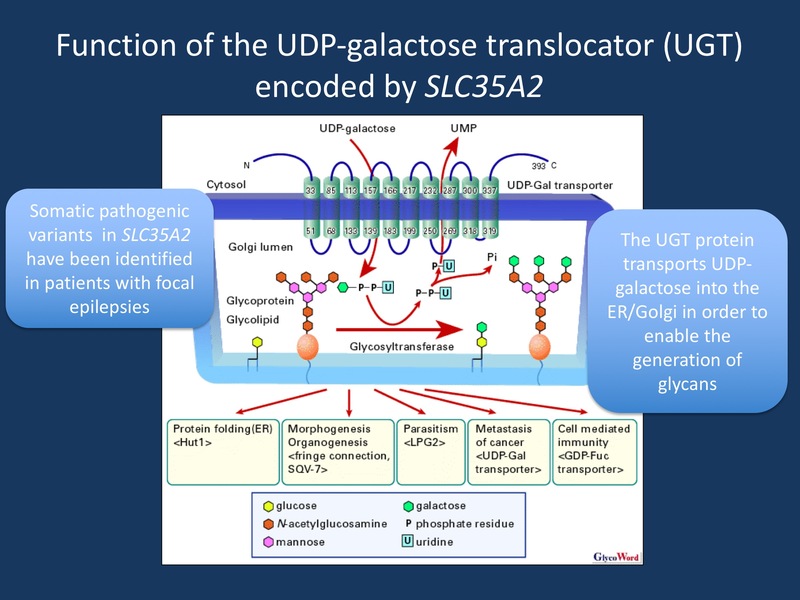 Within the ER and Golgi, UDP-bound galactose is then used to add galactose residues to glycoproteins and glycolipids. If the UDP-galactose transporter is non-functional, glycolsylation cannot proceed completely, leading to a congenital disorder of glycosylation. The cartoon is modified from Glycoforum (http://www.glycoforum.gr.jp/science/word/glycoprotein/GPC03E.html) under a Fair Use Agreement and with the agreement of the authors. An unusual suspect for focal epilepsies. Germline pathogenic variants in SLC35A2, which is located on the X chromosome, cause an epileptic encephalopathy in females characterized by intractable infantile spasms with hypsarrhythmia and significant developmental delays. The onset is usually in the first 3 months of life. Reported brain MRI findings include cerebral and cerebellar atrophy, thinning of the corpus callosum, and abnormalities of myelination. Some patients additionally demonstrate abnormal serum transferrin profiles, consistent with glycosylation defects. Rare affected males have been reported who are somatic mosaic for pathogenic variants in peripheral blood leukocytes. SLC35A2 encodes a uridine diphosphate-galactose transporter that transports galactose from the cytosol into Golgi vesicles and serves as a glycosyl donor for the generation of glycans. Both the clinical features of previously reported patients and the known function of SLC35A2 make it an unusual candidate to cause refractory focal epilepsy. A broad clinical spectrum. Winawer and colleagues examined brain tissue of 56 patients who underwent surgical resection for refractory focal seizures and identified mosaic variants in SLC35A2 in 5 patients, four male and one female. The SLC35A2 variants were not detectable in blood in any of these individuals, indicating a postzygotic mutational event. Three patients had normal MRIs prior to surgery, and two had FCD visible on MRI. The three patients with normal MRIs had typical development and no features of SLC35A2-encephalopathy. The two males with visible FCD on MRI both had epileptic spasms and higher variant allele fractions, which may explain their more severe presentation. Interestingly, pathology of resected brain tissue revealed FCD type 1a in two of the apparently non-lesional cases. Focal cortical dysplasia type 1a. Somatic mosaicism of genes in the mTOR/PI3K/AKT pathway has been previously reported as a cause of FCD type 2, which is characterized by disorganization of the tissue architecture with dysplastic, megalocytic neurons mixed with normal neurons. In contrast, FCD type 1 is defined by dyslamination and disorganization of the tissue architecture but with morphologically normal neurons. MRI is often considered non-lesional in patients with FCD type 1a because the cellular density of the cortex is unchanged. While several genes have been identified in FCD type 2, so far no genetic causes have been identified in patients with FCD type 1a. Crossing the divide. The findings by Winawer and colleagues provide evidence that different genetic mechanisms involving the same genes may lead to very different phenotypes. One the one hand, germline pathogenic variants in SLC35A2 cause a severe early-onset epileptic encephalopathy, primarily affecting females. However, postzygotic somatic mutational events involving SLC35A2, confining the pathogenic variant primarily to the brain, can cause apparently non-lesional focal epilepsies with typical cognitive development. In both cases, dysfunction of SLC35A2 leads to epilepsies but with very different outcomes in terms of development. These findings bridge the divide between the genetic epileptic encephalopathies and non-lesional focal epilepsies and suggest that the underlying genes may be the same in some cases. What you need to know. In a study of 56 patients who underwent surgical resection for both lesional and non-lesional refractory focal epilepsy, Winawer and colleagues identified somatic pathogenic variants in SLC35A2 in 5 individuals. The variant was not detectable in blood in any of the 5 patients, indicative of a postzygotic event. Variant fractions ranged from 4% – 53%, and two individuals with higher variant allele fractions displayed more severe phenotypes consistent with epileptic encephalopathy. Although not conclusive, these data suggest that a higher fraction of variant alleles in the brain may correlate with a more severe phenotype. Two patients had an identifiable focal cortical dysplasia prior to surgery. However in two of the three patients who had normal brain imaging, pathology post-surgery was consistent with focal cortical dysplasia type 1a. This is the first gene to be associated with focal cortical dysplasia type 1a. This entry was posted in Brain malformations, Updates and tagged focal cortical dysplasia, focal epilepsy, mosaicism, non-lesional, SLC35A2. Bookmark the permalink.